There is something sacred about sitting around a fire and listening to stories when the weather is cold and the season is dark. I think we tell ourselves we sit there for the warmth that the fire gives. But I also think that while the warmth might begin as a spark from the fire that rises toward the sky, it’s only the beginning. That spark lights a flame in the hearts of those gathered round that is fed by the laughter and love and shared joy in the moment. It is then that we are loathe to leave, telling ourselves that when we move away from the fireside, we will feel the chill in the air, and the warmth will be gone, and we will be cold and all will be dark again. Giving thanks for the warmth that is long-lasting, the kind that comes from good friends, good conversations, lots of laughter, and light and love. Hang in there. Though the dark seems long-lasting, the Light is coming. It was early evening when she came down the stairs and told us she was going to church the next morning. She needed to go, and so she was going. And anyone else who wanted to was welcome, more than welcome–she’d love the company–to go with her. To say I was taken aback would be an understatement. I was speechless for a moment or two. Not because I thought she was wrong for saying it, but because I was a little shocked–and envious. Here was a young woman, my sister, younger than I, speaking her mind. Saying what she needed. The thing is, no one thought she was wrong or inappropriate for speaking up. Quite the opposite. We all worked it out so it could happen. And so it did. And it was a good thing. Over the weekend I heard two people sharing stories about a mutual friend. It seems that he is a particular eater. Not picky. But intentional. I get it. So he went to a gathering at one of the friends’ house and under one arm he carried a blender. In his hand he held a bag of things to blend. He was there for the fellowship, and knowing that he probably wouldn’t be able to eat what was there, he carried his own vittles. And no one thought unkindly of him. Hearing the story I was again envious that this man was able to take care of himself, in the least obtrusive way possible. He did what he needed to do for him, which made him able to be a better friend to all at the party–because he wasn’t stressed over the menu and what he could or could not eat. My sister was a better parent, I’d daresay, after she was able to go and feed her soul as she had expressed she needed to do. But that’s what I fear, I think. Bad parent. Spouse. Friend. Family. The truth is that I think those who love me will likely shrug and say, “Huh, never knew that, okay.” And the ones who don’t may very well tsk tsk and shake their heads and maybe even wag their tongues–but I can’t let that keep me from speaking up. Besides, my needs are not really all that interesting fodder for gossip anyway. 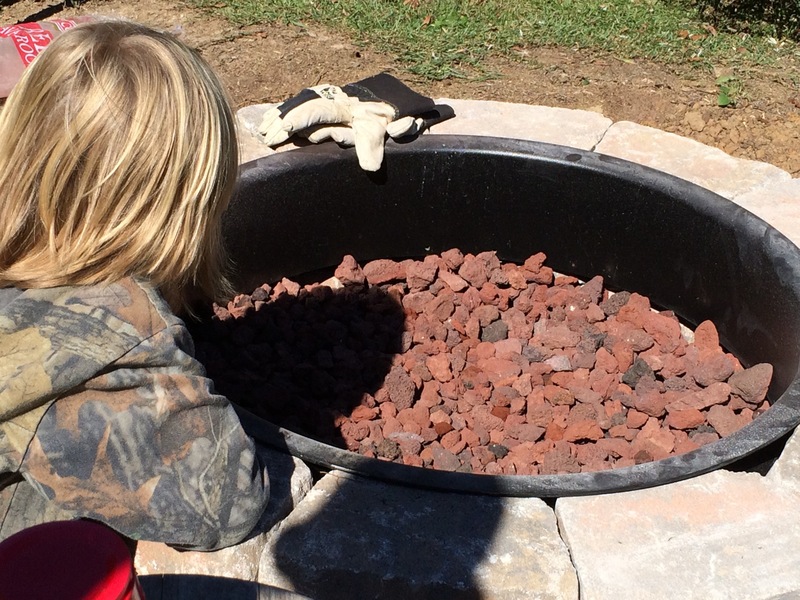 Last fall I really wanted a fire pit. I hinted around and no one was biting. (Well, who can blame them–I was being really subtle so as to be more grace-filled…..*sigh*) Finally I resorted to “sending pins” on Pinterest and YouTube how-to videos to the Fella and my oldest. I got that fire pit! On my birthday. And the adventures we’ve had since we got it? It was hard for me to speak up. (Well, I came close, right? With the videos and pins?) But I think my people were a little relieved that they didn’t have to guess or try to hack into my Amazon account to see what I might want. Took me nearly twelve years of marriage to figure that one out, but now that I have, I’ve figured out it’s actually pretty nice. And if it can’t be done or made or given, well that’s okay too. That’s part of this speaking your needs thing. At least someone has thought about it and tried. What’s on your heart? What matters to you? What would mean the world to you if someone would just…..? Tell them. Speak up. It doesn’t matter what it is, if it comes from deep down within you, this need, then it’s okay. Just tell someone you love and trust. Tell someone what you need. I’ll be you’ll be surprised. Tonight I’m thankful for those who listen to me and who encourage me and give me permission to want and hope and need. And speak up. 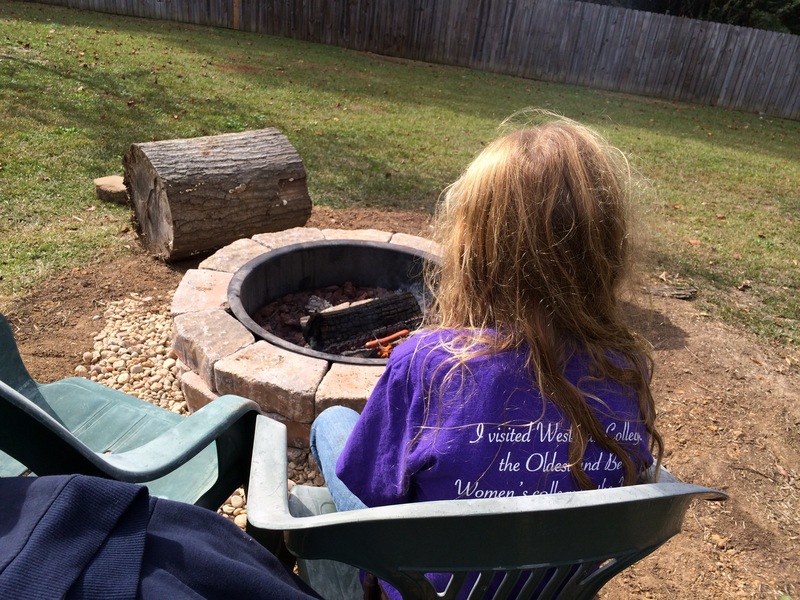 Most of all I’m thankful for my fire pit, which is fun in itself, but also warms my toes–and my heart, as I remember that I was heard when I spoke my heart…..and it was okay. 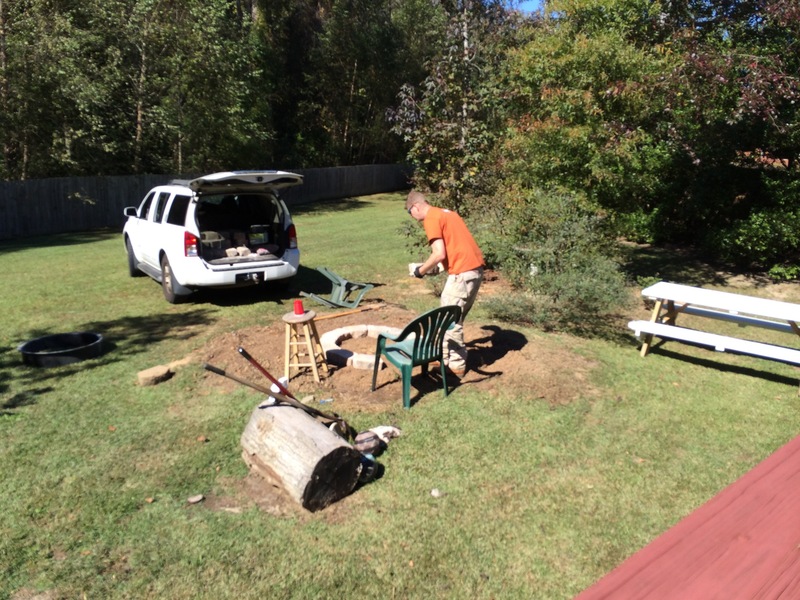 My fire pit being built, because I spoke up. To tell this story, I need to share some background information. First of all, last Monday the Fella took the day off from work to build me a fire pit. He went and got the supplies from the getting place, and they even had a kit to make it a little easier. When he got home he had all kinds of help in the form of the zoo crew. 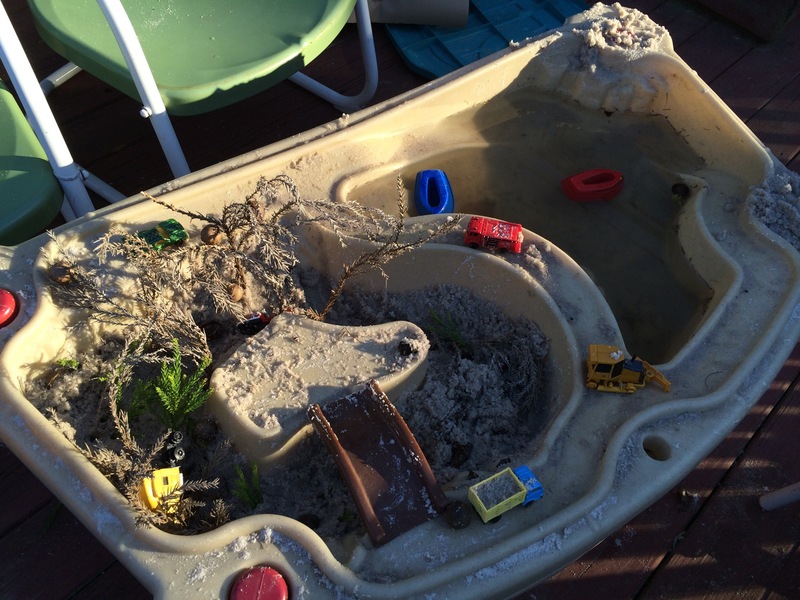 They dug, plotted, placed, and poured. And we had us a fire pit. 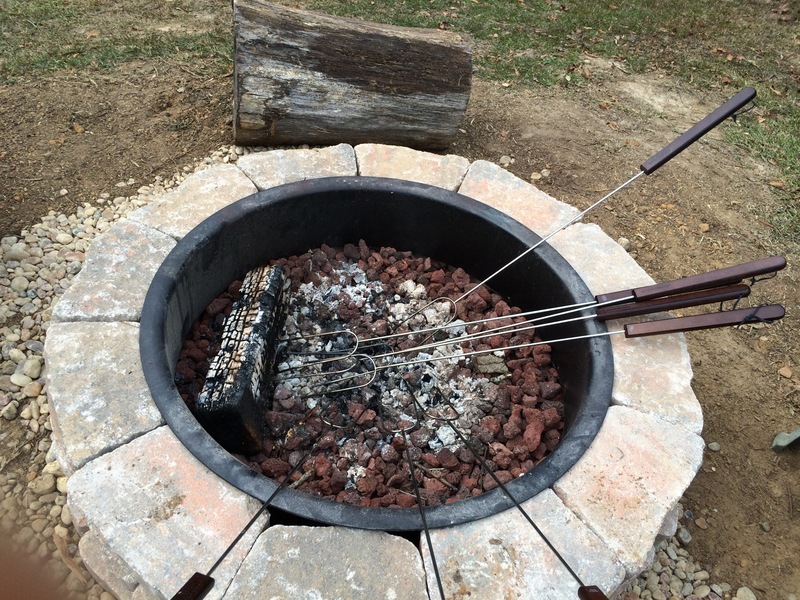 Only we had no firewood or roasting sticks, so we decided to hold off until we got those things. It’s been a fun week of imagining what it would be like. Our Princess wants her big sister to bring home her guitar and for us all to sing songs around the fire. She’s the idyllic one. We made to another trip to the getting place to finish our list, and then–today was the big day. 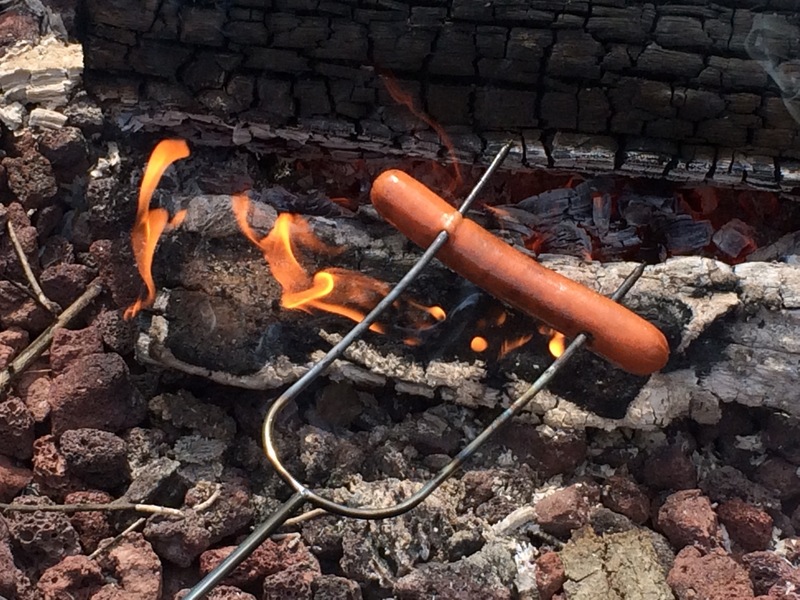 The First Ever Wienie Roast at Buckingham Bottom. I don’t know who was more excited, me or the littles. A simple Sunday was all I was after, y’all. Lunch with the family, wrap up laundry necessities for the week, and then a nap. Yep, that was all I was hoping for. As though lit up in lights, my “words” for the past couple of years came to mind–interruptible, intentional, open, with. How could I turn away someone who was hungry? 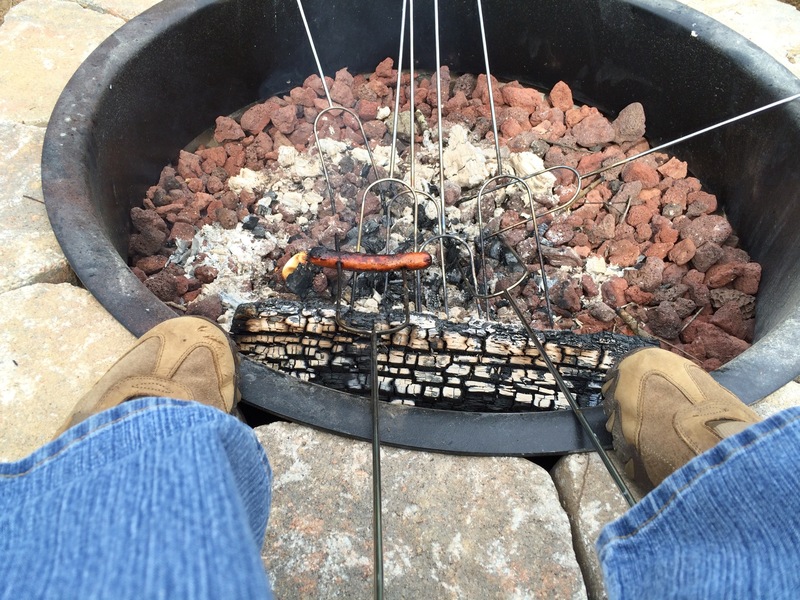 Or at least fascinated by the idea of cooking hot dogs over a fire? I once told someone who asked “what I was” that “well, I love Jesus and how he led his life”…..not trying to be cliche’, but I knew what Jesus would do. And I was sorely ashamed. I told Chloe I needed to wrap up what I was working on, and while I was thinking about it, what would her Mama think? After making sure the Fella was okay with us adding to the guest list, I told our Princess to have all her friends run home and ask their parents. But once we committed to it, I felt at peace. Which is what You were aiming for up there, huh? I cut up apples (I cannot feed other people’s children just hot dogs, save that lack of nutritional balance for my own crew) and put everything we needed on a tray. When I walked out they were so excited; they were all sitting by the fire on logs from our old tree, empty roasting sticks already in their hands. They were too sweet. 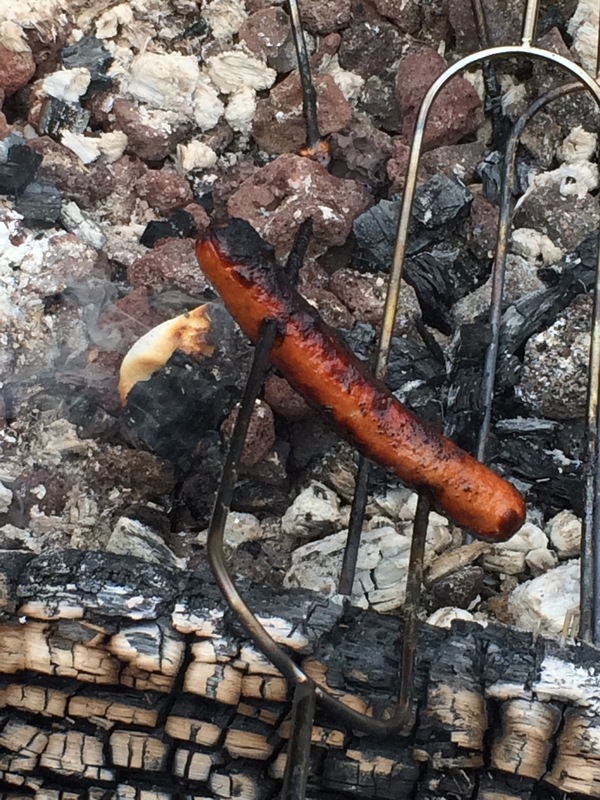 No one except mine had actually roasted hot dogs much if at all. Chloe said she didn’t even like hot dogs until today. There’s something magical about a fire, isn’t there? The flavor it adds to food, yes. But the camaraderie of sitting around it and talking and cooking over the flames, watching the smoke chase the “pretty ones,” and mouths watering in anticipation–it takes us back to our roots, doesn’t it? Cooking outdoors, over a fire. Yep. Magical. And I could see it in their eyes. 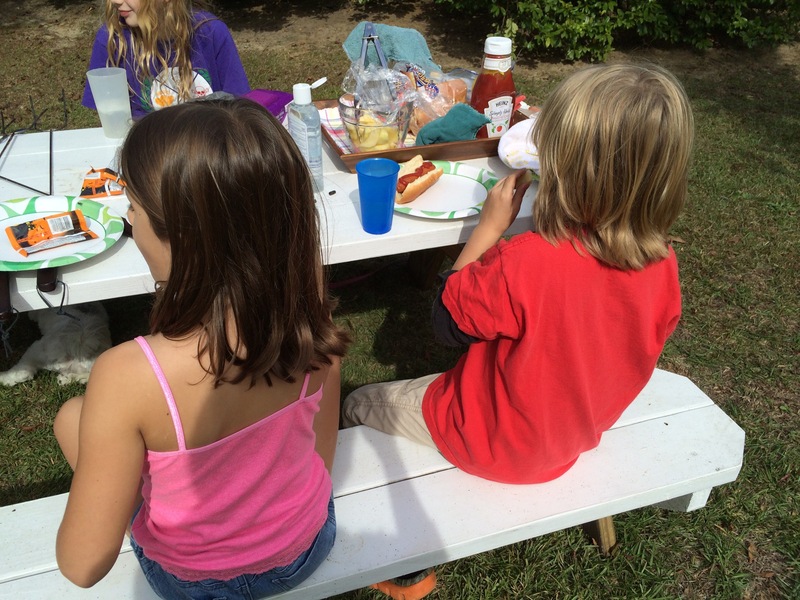 Everyone wanted to keep roasting, they each ate two hot dogs, with the exception of Chloe (but she did enjoy the one! )–only the second one was with no bun. I know that they would have kept roasting many, many more if we hadn’t made the rule “You roast it, you eat it.” I’ve felt the same way over many years of wienie roasts. The roasting is the best part, but you can only eat so much. The struggle is real. 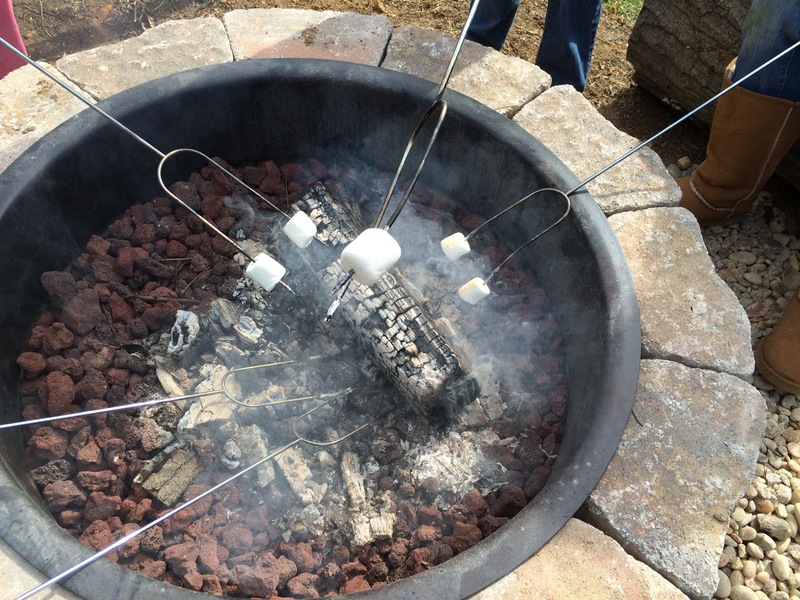 When we moved on to the marshmallows, I was faced with giving them a number, their limit of the max they could roast and eat. We came up with four, and I honestly have no idea why. It just seemed like a nice round, even number. I didn’t want anyone to get too hyped up or go home sick from all that sugar. So four was it. And again Chloe was brave and tried one. One. 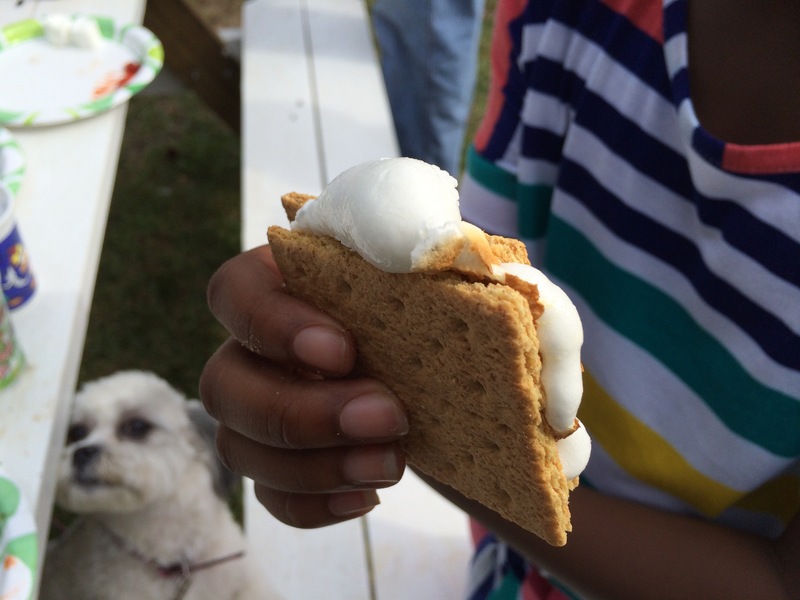 She doesn’t like marshmallows, but she found out she does love roasted marshmallows. Awesome. Listening to them as they sat on the logs they’ve rolled around the yard for months now, realizing that I almost missed out on this fun and fellowship, I knew some church was going on around that fire–and not a word of sermon preached. Of course there was some smack talk going on about who could cook the best hot dog ever, and I might have been the one to start it. I finished it too. After all had their fill, I sat down by the fire that was, by this time, dying out. I found a sweet spot over white ashes and sat and sat and waited and waited. Yeah, the roasting is definitely my favorite part. And after a long time of sitting and waiting, I had the perfect hot dog. Maybe that’s what folks who love to fish feel. All that sitting and waiting coming to fruition….. In the end we decided by a show of hands that everyone had fun and everyone loved the food, so we all were wieners–I mean, winners. This afternoon I saw this quoted by Advent Conspiracy. And my heart breathed a sigh and said, “Yes.” And I knew what this is saying, because I lived it today. I got to reclaim my own real life today. And oh, was it a glorious one! Tonight I give thanks for a family tradition started by my Granny years ago and continued on by my Aunt and all of our family still. There truly is nothing else like it. I am grateful for my family and their gift of time and energy in making my dream a reality. Most of all, I’m thankful for a little girl’s question that turned my day on its end, and for an unplanned journey that wound up being the best one after all. Who can you be interruptible for and be with? What can you be open to and intentional about? It just might make your day. 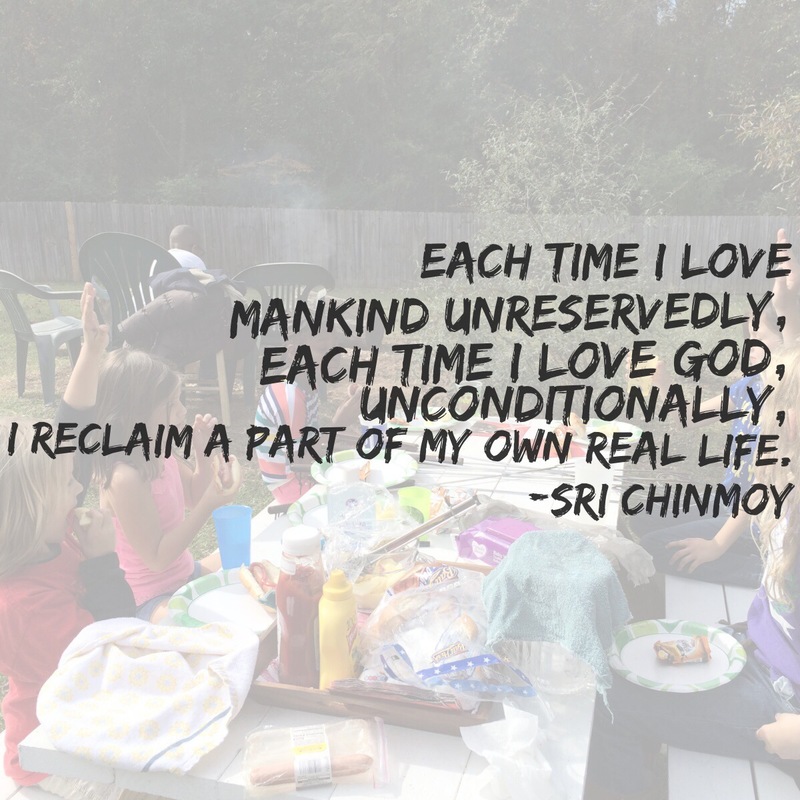 Go reclaim your own real life.